Design your event’s badge on the Boomset web platform to cultivate networking at your event. Dozens of sizes and styles are available for your unique event needs. Choose from paper badges to RFID wristbands, plastic cards, and more. An easy-to-use, versatile design tool with the ability to make changes in real-time for instant printing. Easy self-check-in kiosk stations encourage attendees to view open/available workshop sessions on Boomset Smart Screens and edit/reprint their schedule right then and there! 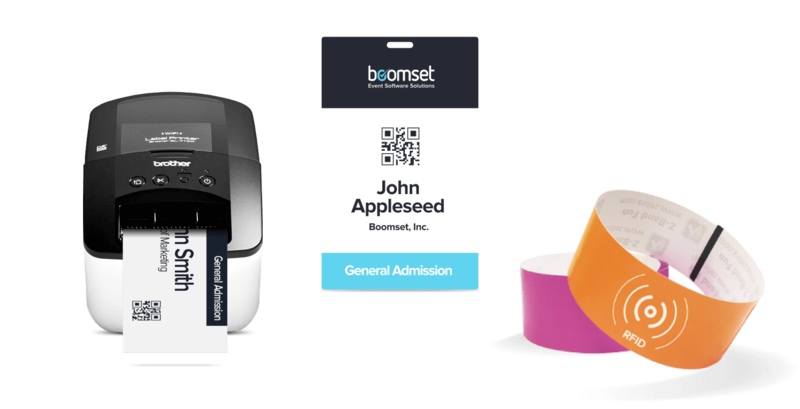 See how Boomset can streamline your on-site experiences to maximize each and every unique event's potential. Intuitive solutions - unified on one platform - and designed to make live experiences better. With one software system and their partners, we were able to communicate and work more efficiently, making 2017’s Redken Symposium even better. We’re absolutely thrilled with Boomset! Overall, our organization would highly recommend using Boomset. They are also always keeping up with the trends in the meeting industry to better improve their software and keep your organization on the cutting edge with on-site registration technology. Copyright © 2019 Boomset, Inc. All Rights Reserved.